Alcalean by Primaforce offers 100% high quality acetyl l-carnitine while aiding workout performance, burning fat, and enhancing recovery. Research shows that Alcalean also helps to improve memory, learning capacity, hearing and visual function, reduce stress, eliminate depression, and promote cardiovascular function. This all purpose post-workout protein provides great results and overall health when accompanied with a balanced diet and exercise. Studies have shown that one of the most effective nutrients required to enhance youthful cellular energy metabolism is the acetyl l-carnitine amino acid. This amino acid functions by way of several different mechanisms to protect those cells related to the effects of aging. As a dietary take one capsule one to three times daily or as recommended by a physician or athletic trainer. One capsule offers 500 mg of acetyl l-carnitine. 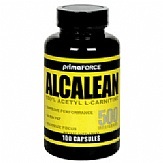 If you are looking for a supplement that helps you decrease muscle fatigue while utilizing stored fat for energy, Alcalean Primaforce is the product you have been dreaming of. After just a few weeks of using this formula, you will begin to notice an improvement in how your muscles stand up to strain and exertion while looking and feeling great. Every person whether training or not should have a ready supply of l-carnitine and Primaforce provides all the benefits of an essential staple in healthy nutrition.